Kid Friendly Rating: 12+ Like most Stephen King novels, the book contains some adult themes and situations, but it doesn’t stray very far into adult territory. 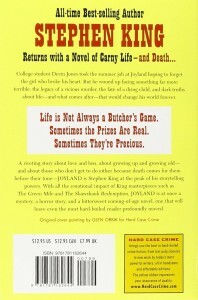 Devin Jones is a college student in 1973 who takes a summer job as a carny at a run-down theme park in North Carolina, Joyland. As an employee at the park, Devin discovers he has the dubious honor of a special talent for “wearing the fur” (playing the park mascot, Howie the Hound), and further earns the trust and respect of park management by saving a girl from choking on a hot dog. Over the course of the summer, Devin learns about a grisly murder mystery that occurred years ago in the park’s haunted house. To this date, rumors swirl that the victim’s ghost is sometimes seen walking the grounds. Devin’s curiosity gets the best of him, and he can’t resist attempting to piece together the crime and solve the mystery of the alleged ghost. Stephen King’s status as one of the world’s preeminent horror fiction writers is virtually unquestioned, but one of the interesting things about his writing, to me, is that he puts out some really fantastic work when he strays slightly from the familiar pure-horror genres. The Body (aka Stand by Me), Rita Hayworth and the Shawshank Redemption, Hearts in Atlantis and The Green Mile stand among some of his most interesting titles. Although each of these stories still have one foot in horror or the supernatural, each seem a good deal more sentimental than King’s norm. My wife (who is also an avid reader of Stephen King) and I have also lamented to each other that sometimes King seems to drive his own stories off the rails by doing what we call, “and then there were aliens.” From a Buick 8 and The Tommyknockers come to mind. Nothing against alien/monster stories, mind you. It just feels like low-hanging fruit at times to inject some type of mythical creature when the narrative is strong enough without it. With all of this in mind, I was immediately interested to find that King was taking a stab at sort of a pulp-crime novel, and I was not disappointed. The book contains shades of The Body’s coming-of-age themes, as Devin enters as an uncertain college kid trying to keep his mind off the girlfriend who chose a summer job in Boston with a friend over him. 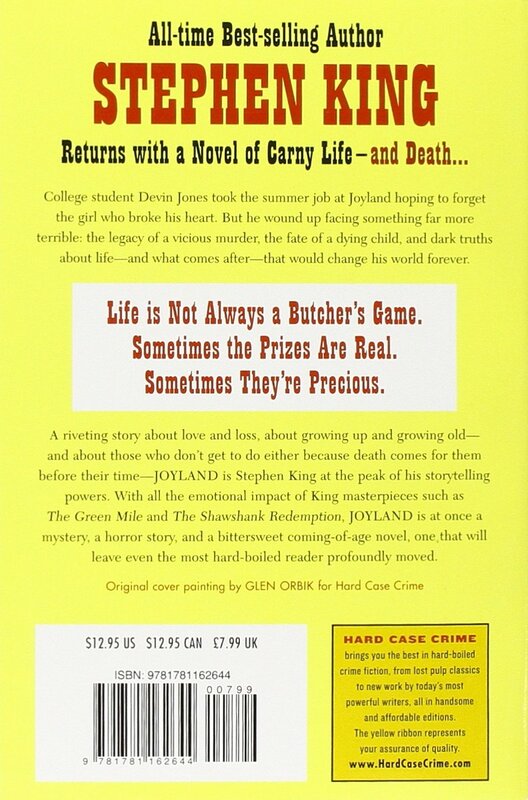 As his relationship with his girlfriend further deteriorates, Devin becomes immersed in the culture of Joyland, and grows into his role, both as an employee, and an individual young man. 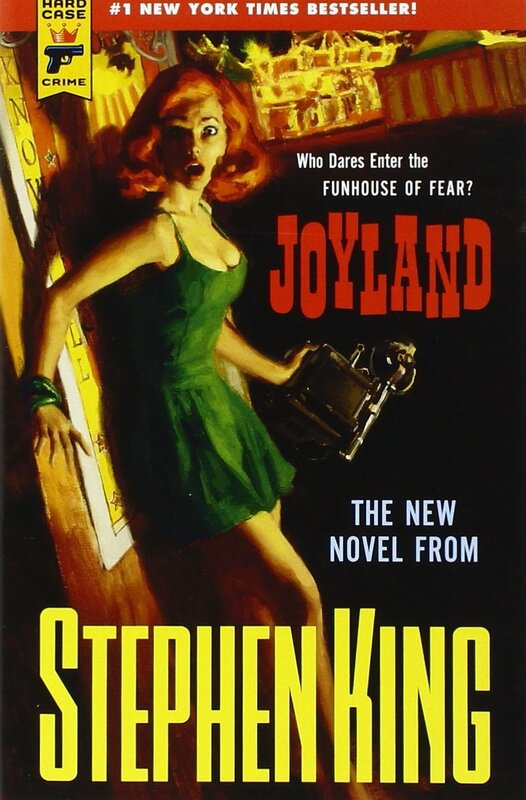 King has noted Canobie Lake Park in Salem, NH, as one of the main sources of inspiration for Joyland as a theme park, but it stands as sort of a embodiment of many old-time local theme parks around the United States. Readers will probably find lots of parallels between this place and the familiar haunts of their youth. I myself was reminded constantly of Kennywood in Pittsburgh, Pa. While the book winds down to a somewhat predictable conclusion, this did not greatly affect my overall enjoyment. As they say, the fun is in the journey, not the destination. King paces the story very quickly, and at only 288 pages, it’s over a bit too soon, if only because I would have liked to spend more time reading it. This should be a fun, quick diversion for any longtime fans of Stephen King, or fans of mystery/crime novels, generally. I give it 4/5 stars.